The vision for creating a Midwestern network among several emerging immigrant economic development initiatives, many of which launched from 2010 through 2012, began to take shape in the fall of 2012. Staff, board, and key organizational leaders from Global Detroit, Welcome Dayton, Global Cleveland, Vibrant Pittsburgh, GlobalPittsburgh, St. Louis Mosaic Project, and the Immigrant Welcome Center of Indianapolis were becoming increasingly aware of one another’s work while crossing paths at the National Immigration Integration Conferences, Welcoming America convenings, the Chicago Council of Global Affairs’ Midwest Immigration Task Force meetings, the National Immigration Forum’s Midwest Summit on Immigration, and other meetings. These short conversations left organizations with a yearning for more opportunities to share insights, experiences, best practices, challenges, and other ideas that are discussed through a network of peers. In 2013, Global Detroit drafted a concept paper to illustrate the benefits organized collaboration would offer immigrant economic development groups in the Midwest. The concept paper was distributed to nearly a dozen local initiatives and potential funders. This paper sprouted the Initial WE Global Network Convening in June 2013, which hosted over 150 participants from nearly a dozen separate major Midwest metro areas. Global Detroit raised some $30,000 towards the Initial WE Global Network Convening in Detroit. Vibrant Pittsburgh and GlobalPittsburgh were selected to co-host a second Convening in Pittsburgh – with the support of Global Detroit and assistance from Welcoming America. Fundraising efforts by Global Detroit, Vibrant Pittsburgh, and GlobalPittsburgh resulted in $68,000 for the second WE Global Network Convening. The 2014 Convening brought over 225 national leaders and local practitioners from across the Midwest and beyond together to discuss best practices in the emerging field of immigrant economic development. Hoping to transform their struggling Midwest economies into more prosperous 21st Century economic engines, these local practitioners are engaged in immigrant economic development initiatives in more than 20 Rust Belt cities. The final day of the Convening was a working session with 30 local initiatives and a dozen national experts who helped prioritize and hone future activities of the Network. They established a ten state geographic focus (NY, PA, OH, MI, IN, MO, IL, IA, MN, and WI) and agreed that Welcoming America should serve as the Network’s corporate home. 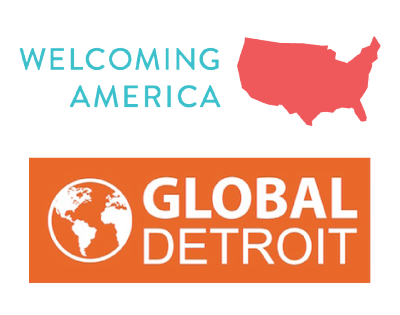 The group authorized Welcoming America to work with Global Detroit and outside consultants to seek funding and execute the Network’s vision. There was a strong view that the Network would need to find a new name and develop a strong brand identity. Since the Convening, collaboration among these local economic development organization has only continued to blossom. The Network has received a $60,000 planning grant from the Knight Foundation and a $40,000 JM Kaplan Fund grant to implement an initial work plan. These grants have helped fund the development of a strategy document, overhaul of the Network website, execution of ongoing communication and social media efforts, an ethnic media demonstration project, the creation of a state and local policy playbook, five city-to-city visits, and the creation of a communications strategy. Additionally, the grants helped fund a naming and branding strategy, and in early 2015, what was originally called the Global Great Lakes Network became the WE Global Network.